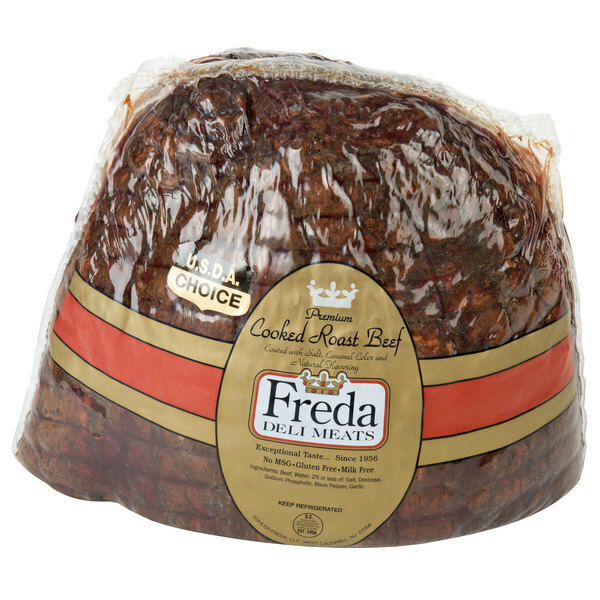 Create sandwiches packed with flavor in your deli, sandwich shop, or cafe with this Freda Deli Meats 7 lb. medium rare cooked roast beef. Expertly trimmed and spiced, this cap-off, top round roast beef deli meat will produce lean, thin cuts allowing you to easily and quickly prepare gourmet sandwiches packed with tender flavor. 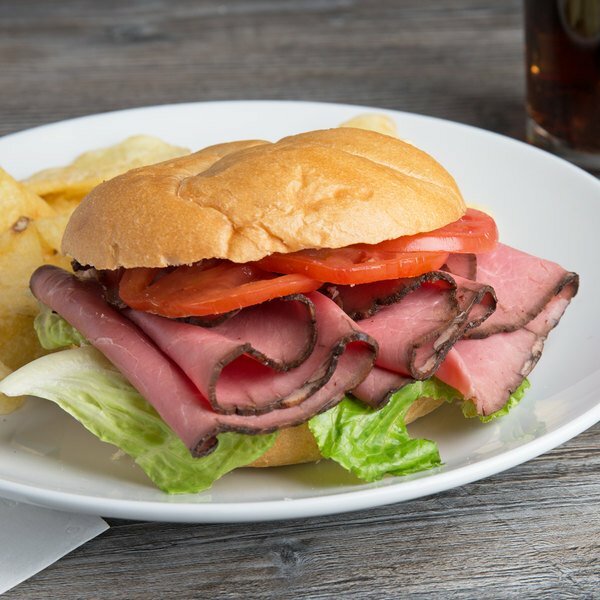 Prepare succulent sandwiches piled high with lean, thin cuts of this deluxe roast beef and pair with dijon mustard, caramelized onions, and provolone cheese. Or, incorporate this meat onto a deli tray, layered with honey cured glazed and applewood ham, and oven roasted turkey alongside american, provolone, and swiss cheese, for a great party platter option for your customers' events. It's made from USDA Choice beef, lightly seasoned, and roasted low and slow to ensure medium rare cooked, juicy meat. With 0g trans fat and only 70 calories per serving, this roast beef is an ideal option for the health-conscious consumer. It's also free of MSG so you can rest assured that your customers are receiving a natural, quality product. Ready for immediate service, slice it by hand or with a slicer to the desired thickness, and serve. Based in West Cadwell, New Jersey, Freda Deli Meats has been engaged in the traditional art of crafting fine deli meats since 1956. 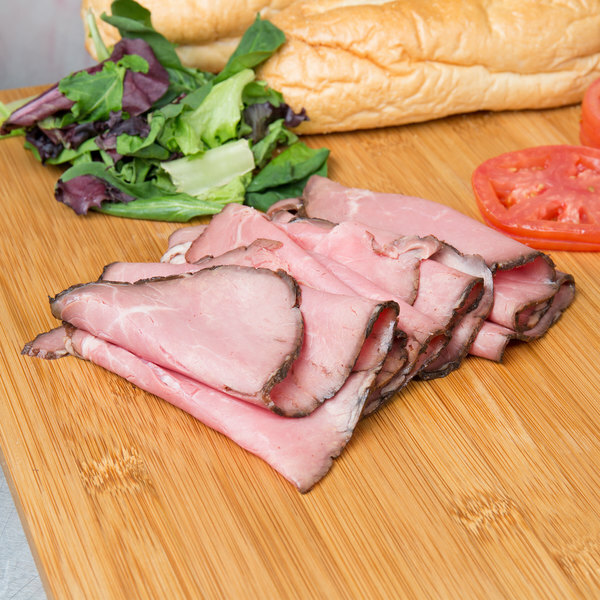 Freda Deli Meats strives to set the industry standard for premium quality deli meats and to maintain consistency from slice to slice. Taking pride in every cut, they combine old world European techniques with original family recipes and cooking methods to deliver a delicious and healthy variety of meats. From tender beef for your classic reuben sandwiches to mouthwatering ham for hawaiian pizza, Freda Deli Meats has you covered.